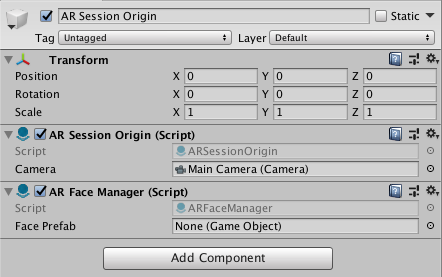 For face tracking, ARFoundation introduces another AR Manager called ARFaceManager, which you can add as a component on to ARSessionOrigin's' GameObject. This component will manage the addition, updating, and removal of GameObjects to represent faces. ARFaceManager subscribes to relevant AR Face Subsystem events, such as faceAdded, faceUpdated, and faceRemoved, and creates GameObjects for each detected trackable face. The generated GameObjects are parented to a special GameObject under the ARSessionOrigin, accessible via ARSessionOrigin.trackablesParent. 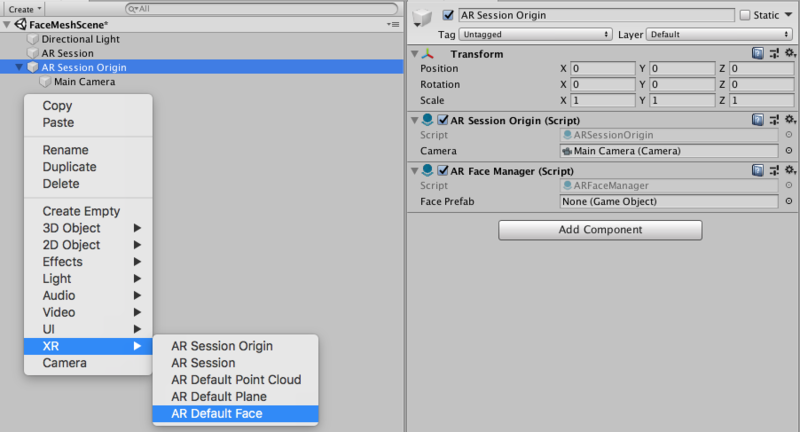 ARFaceManager also accepts an optional prefab, which will be instantiated to represent the face. If no prefab is specified, a GameObject is created with an ARFace component. The ARFace component stores information about the trackable face, but does not visualize it. Its Transform is updated by its manager whenever the AR device reports an update. It has a session-unique TrackableId associated with it, and you can access an individual face by id through its manager. To do something with the generated faces, subscribe to the appropriate event on the ARFace component. removed Invoked when a face is about to be removed. You can then add any prefab as a child of this GameObject and it will render at the position and orientation of your face. To visualize faces, you'll need to create a prefab or GameObject which includes a component that subscribes to ARFace's added, updated and removed events. ARFoundation includes such a component: ARFaceMeshVisualizer. This component will generate a Mesh from the mesh vertices of a face trackable and assign it to a MeshCollider and MeshFilter, if present. There is a menu item GameObject > XR > AR Default Face which will create a new GameObject which you can use to create your prefab. Once created, you should assign it to the ARFaceManager's Face Prefab field. You can use it directly or create a prefab by dragging the GameObject into your Assets folder. 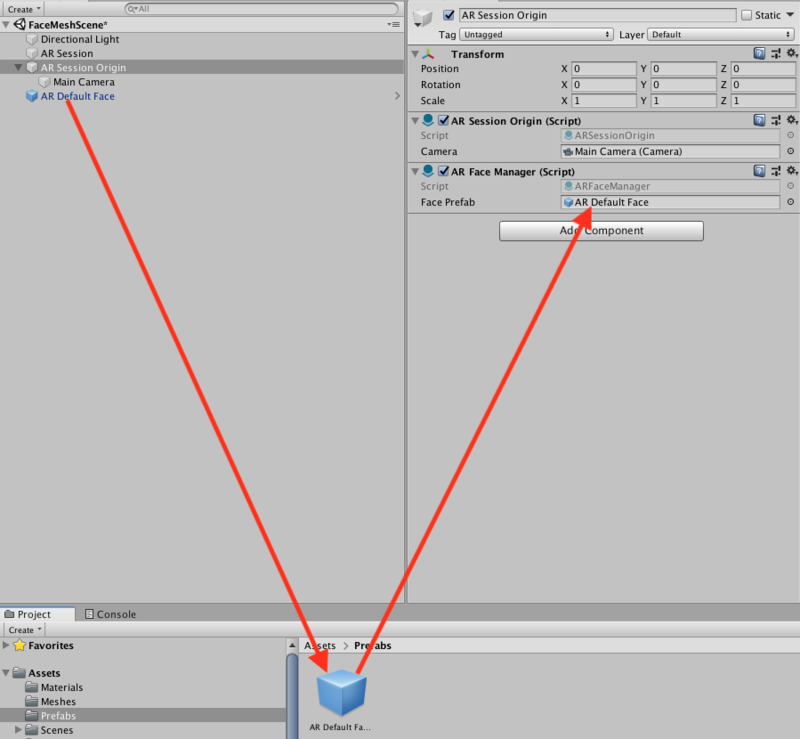 It is recommended to save the AR Default Face as a prefab first, delete the AR Default Face GameObject, and then use that in the prefab field as leaving the face in your scene will leave a zero scale plane artifact in the scene.